Alyse Kotyk is a digital reporter for Richmond News. Her work has also appeared with the Globe and Mail, rabble.ca, CTV News, Pilcrow Pamphlet and Vancouver Observer. Previously, Alyse wrote for Quietly Media, where she completed over 500 pieces about mental health and wellness. She was also the editor of Servants Quarters, a publication with an international audience that highlights reflections by individuals working in urban poor communities. She also wrote for onQ magazine, the Queen’s University Gazette and for several non-profits. In 2016, she received the Jack Webster Student Journalism Award and in 2017, the Scott Schill Memorial Scholarship. Alyse is passionate about sharing narratives and believes everyone has a valuable story. Click on the pages above to view selections of her work. A former flight attendant is getting ready to take the next steps in a class-action lawsuit against WestJet after the airline lost its appeal asking for the case to be thrown out. The suit alleges the airline had a work culture that tolerated harassment of female employees. Mandalena Lewis, who used to work out of Vancouver International Airport, is pursuing the class action because she says she was sexually assaulted by a pilot in 2010. She told the company about it, she said, but alleges they failed to protect her and other female flight attendants. On Thursday, a British Columbia Supreme Court judge dismissed WestJet’s application to strike the legal action, rejecting the company’s claims that the dispute belongs before a human rights tribunal and workers’ compensation board. “Winning this appeal was a really big deal, and it’s not just a big deal for women within WestJet but across the work field in Canada,” Lewis said, adding she values the support she’s received from current and former airline employees while pursuing this class action. Lewis said the lawsuit intends to represent all of WestJet’s past and current female flight attendants whose employment contract included an anti-harassment promise. The case has yet to be approved by the court as a class action proceeding and Lewis said she hopes to have the class action certified in the next year. “Now that we have this momentum I want to take advantage of it and really make sure that we’re continuing on and pushing on towards certification,” she said. In the meantime, Lewis said she hopes she will gather more “in-person” support, reflecting back on when she led a campaign at YVR last summer aiming to shed light on sexual harassment in the airline industry. The Canadian government launched its long-awaited national housing strategy Wednesday, but Vancouver advocates say the move is long overdue in a city already that is facing record levels of homelessness and an affordability crisis. The 10-year plan includes some bold promises such as committing $40 billion to build 100,000 new affordable housing units, repairing 300,000 existing affordable housing units. The initiative also aims to cut chronic homelessness in half and remove 530,000 households from “housing need” by 2027. Vancouver affordable housing advocates say the move is long overdue. According to Union Gospel Mission spokesperson Jeremy Hunka, it may be too late for some of the 2,100 currently facing homelessness in the city. Vancouver Mayor Gregor Robertson speaks at the announcement of Canada’s national housing strategy. The strategy also allocates $4 billion for a national housing benefit intended to provide low-income renters with an annual $2,500-subsidy beginning in 2020. 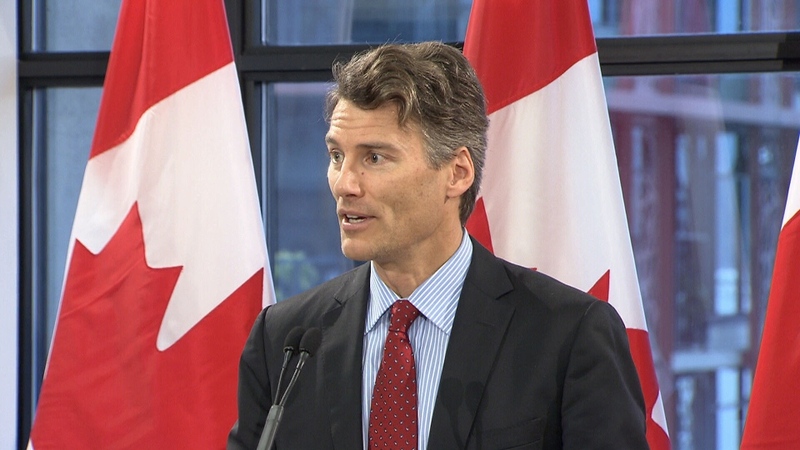 Vancouver Mayor Gregor Robertson said the city has struggled to have conversations about housing with provincial and federal governments in the past. “It’s been an embarrassment to not have a national housing strategy as a country and it’s fantastic to see one delivered that has had rigour and has had input from all levels,” he said Wednesday. B.C. Premier John Horgan also echoed the sentiment that governments need to collaborate to address housing affordability and homelessness. Robertson said the housing strategy shows just how important “urgent action” is for the country. “We have to treat housing as a human right and it’s critical that our federal government recognizes that and follows through in terms of the monitoring and the reporting on that,” he said. However, both Robertson and Hunka pointed out that while having a strategy is a good start, targets need to be set to ensure the plan is implemented. It’s a 20-hour drive from Standing Rock, North Dakota to the Secwepemc territory of British Columbia in the best conditions. But halfway through her travels last December, Kanahus Manuel and her four children hit a blizzard in Missoula, Montana. Kanahus called her father, Arthur Manuel, who was in Mexico. ‍It was Kanahus’ last car ride with her father. That 10-hour conversation flitted from indigenous protests in Standing Rock, to on-the-ground fights against Kinder Morgan’s pipeline expansion in B.C., to the generations of Manuels growing up as a First Nations family. ‍But Arthur made sure his children got to pick huckleberries and experience First Nations culture. In January, Arthur passed away and left a legacy of First Nations activism behind. As a child of residential schools and son of a First Nations politician, Arthur wanted his children to know and experience elements of indigenous culture that he was never able to. But it wasn’t just his appreciation of mountains and huckleberries that Arthur shared with his children. Instead, he also wanted to teach them that there was another way to live as an indigenous person in Canada. Campus groups are pushing their peers to make it to the polls for British Columbia’s May 9 election, warning that typically low turnout among young voters could make it easier for politicians to ignore them and the issues affecting their lives. Voters younger than 35 tend to have the lowest turnout in Canadian elections and B.C.’s last election was no exception. Fewer than half of registered voters aged 18 to 24 participated in 2013, while fewer than 40 per cent of those aged 25 to 34 voted. And those numbers were worse than the two previous elections. To address these low numbers, the Alliance of BC Students has launched a campaign to increase student voter turnout by providing on-campus information for how and when students can vote. In turn, the group hopes increasing youth turnout will pressure politicians to pay more attention to young voters. And the fewer young people vote, the less incentive political parties have to invest the time and resources into reaching them. Mr. Moscrop added that many of the issues on which parties campaign might not be of interest to young voters, which itself could be an election strategy. Arianna Murphy-Steed, whose group Young Climate Voters BC encourages students to vote with environmental issues in mind, said young people have barriers beyond a simple lack of interest. “We’ve found that a lot of people don’t know that they are eligible to vote,” said Ms. Murphy-Steed, who is a student at the University of British Columbia. The group’s campaign is called Together for Tomorrow. Ms. Murphy-Steed said that with university classes wrapping up before the May election, it could be difficult to provide students with the information they need to vote before they leave campus. She also said many students don’t realize they are eligible to vote if they have lived in B.C. for six months. Elections BC said not having a fixed address also means young voters may not receive information from the agency. Noor Youssef, a political sciences student at UBC, moved to B.C. from Syria five years ago. Even with a Canadian passport and five years of residency in the province, she did not realize she could vote in the upcoming election. Ms. Youssef acknowledged students such as her need to take initiative to understand the issues. For Simka Marshall, chair of the British Columbia Federation of Students, a province-wide organization that launched its Students Are Voting campaign last month to collect voting pledges, the perception of young voters needs to change. “One thing I think is really powerful is to stop promoting the myth that young people are apathetic,” she said. Ms. Marshall said youth voter turnout discussions should help youth feel empowered to participate politically. Across B.C.’s interior, Indigenous communities are deciding whether or not they will support Kinder Morgan’s Trans Mountain pipeline project through mutual benefits agreements (MBA). While most of the media attention has focused on the Coast Salish First Nations near the lower mainland’s metropolitan areas, the majority of the pipeline crosses the traditional territories of interior First Nations, including the Secwepemc Nation in the Shuswap and the Nlaka’pamux to the west of the Okanagan. Over the weekend, the Lower Nicola Indian Band (LNIB) voted to accept their mutual benefits agreement with Kinder Morgan. Near Merritt, LNIB was one of 133 Indigenous communities approached by the energy company to sign an agreement that included financial compensation and employment opportunities. Last November, Kinder Morgan signed a conditional agreement with the LNIB’s chief and council who then called for a community referendum to decide whether or not they would move ahead. LNIB’s Chief Aaron Sam said he did not know which way the vote would go and that he thought the results would be close. For the LNIB, job opportunities are appealing. However, Sam, who is vying to be the NDP candidate for the Fraser-Nicola riding in the upcoming provincial election, said some of his community members are concerned about increased tanker traffic on the coast and how potential oil spills could affect their salmon supply. “I think our community is not that different from many of the concerns that you see from the larger community outside of the Lower Nicola Indian Band,” Sam said. Yet only 187 out of 964 eligible voters — little more than 19 per cent — participated in the referendum. The results were 111 votes for signing the agreement to 75 against with one spoiled ballot. For Kanahus Manuel from the Secwepemc Nation in the Shuswap region of B.C. — an area that would be largely affected by Trans Mountain — chief and councils should not be playing a role in these agreements with Kinder Morgan. Kinder Morgan appears to be positive about these agreements and said it has worked to build relationships with the Indigenous communities that would be affected by the Trans Mountain project. However, Manuel also pointed out that Indigenous-elected chief and council are often in a difficult position when faced with development projects. “We’re forced into this extreme poverty-stricken conditions on Indian reservations where the elected chief and council are being forced to sign under duress for these pipeline projects and mining projects just in order to give the basic needs to the people,” she said. Instead, Manuel said she advocates for a return to traditional Indigenous governance to tackle issues of development and climate change. While the provincial and federal governments may have announced their support for Kinder Morgan’s Trans Mountain pipeline, opponents are continuing to strengthen their fight against the project in court. From whales to rights to conflicts of interest, the reasons for legal challenges are vast and don’t appear to be slowing down. Just last week, Vancouver city councillor Adriane Carr put forward a motion to request judicial review of the province’s environmental approval of Trans Mountain. The motion suggested that First Nations groups were not adequately consulted and there was little assessment of adverse effects on marine life. City council will hear speakers on Feb. 22. In the meantime, however, many other legal challenges are moving forward. PIPE UP and the Province of B.C. On Jan. 31, Democracy Watch and the PIPE UP Network applied for a B.C. Supreme Court order to challenge the province’s approval of Trans Mountain. According to these groups, Kinder Morgan and pipeline-connected companies donated more than $750,000 to the B.C. Liberal Party, creating a conflict of interest in Premier Christy Clark’s support of the project. When asked to comment on this legal challenge, a representative from the Ministry of Environment said the province conducted its own environmental assessment and took the NEB’s decision into consideration. “The information that the ultimate decisions are based on was gathered by professional staff, whose analysis and recommendations were then forwarded to elected officials. The final decision making process is also strictly outlined in statutes,” they said. Even so, PIPE UP Network says the decision to approve the project is still a conflict of interest. “The fate of the Trans Mountain pipeline, which puts our oceans and rivers at extreme risk, should be decided by people who do not have their hands in the pockets of Kinder Morgan and pipeline-connected companies,” said Lynn Perrin, director of PIPE UP Network. For Living Oceans Society and Raincoast Conservation, the project’s issue lies with the National Energy Board’s assessment of Trans Mountain. “The project would mean over 400 tankers a year travelling through the southern residents’ critical habitat on their way to and from Westridge Terminal in Burnaby,” she said. Tuytel said that the tankers bring three main risks to the local whale population: increased ocean noise affecting their ability to communicate and hunt, shortage of food supply and contamination of the ocean from potential oil spills. Currently, Tuytel said the court is considering both parties’ submissions on the case before moving ahead. Multiple First Nations groups including Tsleil-Waututh, Squamish and Coldwater nations have also taken legal action against Trans Mountain and say they were not properly consulted on the pipeline project. Eugene Kung, a staff lawyer with West Coast Environmental Law works closely with the Tsleil-Waututh’s Sacred Trust — an initiative to stop Trans Mountain. He says their case is particularly important because it’s an issue of constitutional rights. Yet as all of these legal challenges progress, Trans Mountain appears unphased. “As cases make their way through the courts, we are continuing to move forward with [the] project — planning, permitting, engagement and design — in order to meet conditions and be ready to begin construction in September 2017,” Lisa Clement, a media relations spokesperson for Trans Mountain told rabble. Even so, Kung believes that legal challenges coupled with community support can overturn a federal decision and stop a pipeline.